Recently, IRB wrongly sent many CP 500 notices to taxpayers which lead to confusion. In the notice, taxpayers were asked to make instalment payment to IRB. The notice states the amount, due date and number of instalments the taxpayer have to pay. If you are one of the average taxpayers (including me) that never heard of CP 500 and yet received this notices, then read more to find out what is it. Tags : IRB, What is? Falling into the family of indirect taxes, the GST is intended to replace the Malaysian service tax and sales tax. GST will be introduced gently and at a rate that would not burden the poor or the middle-class. It is assumed that the Royal Malaysian Customs would be the authority in charge of administering the GST. The GST, also known as a consumption tax, is a tax levied on supplies of goods and services. To the man on the street, it is incurred only when money is spent. 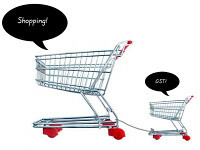 If no consumption occurs, no GST is suffered by the individual. This can be contrasted with an income tax which is payable when income is generated. Goods and services tax (GST) is a tax on the final consumption of goods and services. It is also known as value added tax. GST is a multi-stage tax, which imply that the Government will collects taxes at various stages along the delivery process. GST is ultimately passed to the consumer even though the intermediaries such as manufacturers, wholesalers and retailers paid the taxes during the production and distribution process. Therefore, GST is not a cost to the intermediaries and it will not reflected in their financial statements as an expenditure. Below are the most commonly use terms in GST. If you are like the average taxpayer, chances are you are often confused by the terms “deduction”, “allowance”, “relief”, or “exemption”. These words are not given separate meanings in the tax legislation but they all operate to reduce your tax bill. It is helpful to distinguish them and to know the meanings usually attributed to them. A deduction is an expense or “outgoing” of the taxpayer which he is entitled to take into account in arriving at any particular figure of income. Is Entertainment Expenses Tax Deductable? For income tax purposes, any expenses incurred in the course of a business will only be eligible for tax deduction if the expenses are solely incurred in producing the business income. It is important to establish the deductibility of an expense as in the event of a field audit which results in the Inland Revenue Board (IRB) discovering an understatement of tax due to claims on expenses which are not tax deductible, a taxpayer will not only suffer additional tax but also a 45% penalty. With effect from year of assessment 2004, entertainment expense will only be eligible for 50% tax deduction except for specific circumstances where it will qualify for full deduction.